← May 5776 bring you sweet adventures! 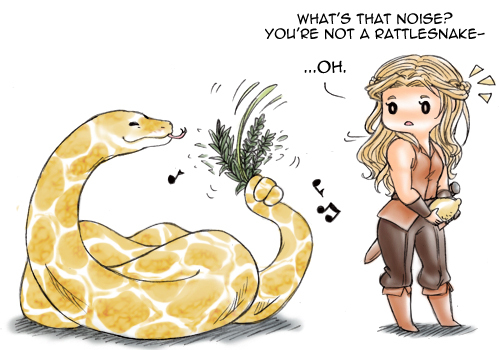 Isaac’s snake shifting form is an albino Burmese python, not a rattler, so Rivka doesn’t understand why she’s hearing that noise…. at first! Nahh, he’s just celebrating Sukkot by shaking the lulav, like you’re supposed to. Chag Sameach! Like Jewish warrior women and dragon shifters? Catch their latest adventure here: A Harvest of Ripe Figs. Drawn by Yeaka, who does adorable snakes and dragons! This entry was posted in Uncategorized and tagged albino burmese python, ashkenazi, cartoon, chibi, couples, etrog, fantasy art, jewish, jewish art, jewish cartoon, lulav, mangoverse, reptile, reptiles, rivka, shifters, snake, snake shifter, snake shifters, snakes, snek, sukkot, warrior woman, yeaka. Bookmark the permalink.